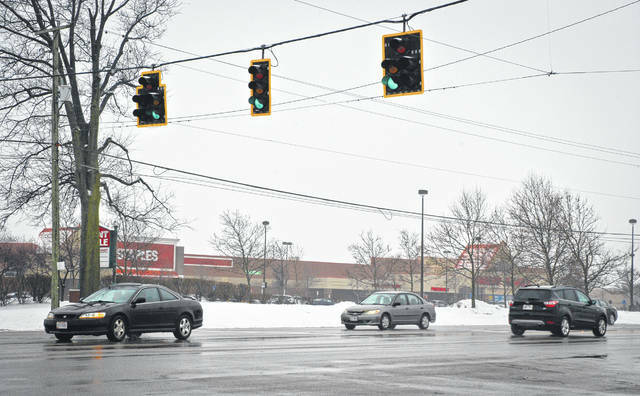 According to a recent study presented to the Delaware County Board of Commissioners, between Coover Road and I-270, there are 35 traffic lights that a motorist traveling the highway will encounter. The light in the photo is located at U.S. Route 23 and Meadow Park Avenue, just north of Powell Road. According to a new study on the U.S. Route 23 corridor, the 17-mile stretch between Coover Road and Interstate 270 contains 35 traffic lights that are reducing the speed of the traffic by 50 percent. Chris Hermann, a member of MKSK Studios in Columbus, presented “The U.S 23 Corridor Study and Action Plan” to the Delaware County Board of Commissioners Thursday during a work session. According to Hermann’s presentation, the study received support from the Delaware County Foundation, the Delaware County Board of Commissioners, and a number of agencies and organizations throughout the county. Hermann said when thinking about the traffic movement in the corridor, one can’t help but notice there are a lot of traffic lights. Hermann then pointed out the Interstate 71 and U.S. Route 36/state Route 37 intersection, noting it is the second busiest freight corridor in the state. Hermann said more east-west connectors would help guide traffic to the various corridors of I-71, U.S. 23, U.S. 42, and U.S. 36/state Route 37 throughout central Ohio. He added the other part of the equation is the workforce of central Ohio is 1.1 million people who an average commute of 24 minutes. Hermann said creating employment centers would keep more people in Delaware County, creating a more balanced growth between residential and economic development. He also said it would help alleviate some of the pressure off the road network. Hermann said the area around the corridor appears to be only 67 percent developed, but he said 9,300 acres of the land is already going through the development process. This entry was tagged Chris Hermann, D. Anthony Botkin, Delaware County Board of Commissioners, MKSK, U.S. 23 Corridor. Bookmark the permalink.